One has no right to love or hate anything if one has not acquired a thorough knowledge of its nature. Great love springs from great knowledge of the beloved object, and if you know it but little you will be able to love it only a little or not at all. We’re eleven chapters in, and the interpreter sitting on your machine is nearly a complete scripting language. It could use a couple of built-in data structures like lists and maps, and it certainly needs a core library for file I/O, user input etc. But the language itself is sufficient. We’ve got a little procedural language in the same vein as BASIC, TCL, Scheme (minus macros), and early versions of Python and Lua. If this was the 80’s, we’d stop here. But, today, many popular languages support “object-oriented programming”. Adding that to Lox will give users a familiar set of tools for writing larger programs. Even if you personally don’t like OOP, this chapter and the next will help you understand how others design and build object systems. If you really hate classes, though, you can skip these two chapters. They are fairly isolated from the rest of the book. Personally, I find it’s good to learn more about the things I dislike. Things look simple at a distance, but as I get closer, details emerge and I gain a more nuanced perspective. Multimethods are the approach you’re least likely to be familiar with. I’d love to talk more about them—I designed a hobby language around them once and they are super rad—but there are only so many pages I can fit in. If you’d like to learn more, take a look at CLOS (the object system in Common Lisp), Dylan, Julia, or Perl 6. Exposes a constructor to create and initialize new instances of the class. Provides a way to store and access fields on instances. 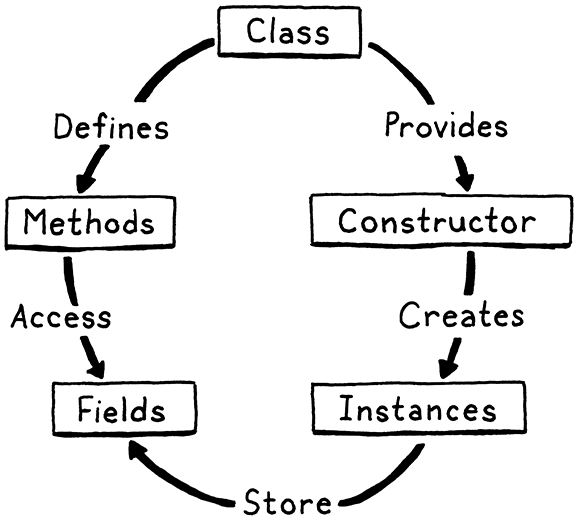 Defines a set of methods shared by all instances of the class that operate on the instances’ state. That’s about as minimal as it gets. Most object-oriented languages, all the way back to Simula, also do inheritance to reuse behavior across classes. We’ll add that in the next chapter. Even kicking that out, we still have a lot to get through. This is a big chapter and everything doesn’t quite come together until we have all of the above pieces, so gather your stamina. It’s like the circle of life, sans Sir Elton John. Not that I’m trying to say methods aren’t fun or anything. Like most dynamically-typed languages, fields are not explicitly listed in the class declaration. Instances are loose bags of data and you can freely add fields to them as you see fit in the middle of normal imperative code. The generated code for the new node is in Appendix II. It stores the name and the methods inside the body. Methods are represented by the existing Stmt.Function class that we use for function declaration AST nodes. It has all the bits of state that we need for a method: name, parameter list, and body. There’s more meat to this than most of the other parsing methods, but it roughly follows the grammar. We’ve already consumed the class keyword, so we look for the expected class name next, followed by the opening curly brace. Once inside the body, we keep parsing method declarations until we hit the closing brace. Each method declaration is parsed by a call to function(), which we defined back in the chapter where functions were introduced. Like we do in any open-ended loop in the parser, we also check for hitting the end of the file. That won’t happen in correct code since a class should have a closing brace at the end, but it ensures the parser doesn’t get stuck in an infinite loop if the user has a syntax error and forgets to correctly end the class body. We aren’t going to worry about resolving the methods themselves yet, so for now all we need to do is declare the class name itself. It’s not common to declare a class as a local variable, but Lox permits it, so we need to handle it correctly. This looks similar to how we execute function declarations. We declare the class’s name in the current environment. Then we turn the class syntax node into a LoxClass, the runtime representation of a class. We circle back and store the class object in the variable we previously declared. That two-stage variable binding process allows references to the class inside its own methods. print DevonshireCream; // Prints "DevonshireCream". We have classes, but they don’t do anything yet. Lox doesn’t have “static” methods that you can call right on the class itself, so without actual instances, classes are useless. Thus instances are the next step. In Smalltalk, even classes are created by calling methods on an existing object, usually the desired superclass. It’s sort of a turtles-all-the-way down thing. It ultimately bottoms out on a few magical classes like Object and Metaclass that the runtime conjures into being ex nihilo. I took a minimal approach with Lox. We already have class objects, and we already have function calls, so we’ll use call expressions on class objects to create new instances. It’s as if a class is a factory function that generates instances of itself. This feels elegant to me, and also spares us the need to introduce syntax like new. Therefore, we can skip past the front end straight into the runtime. The interesting one is call(). When you “call” a class, it instantiates a new LoxInstance for the called class and returns it. The arity() method is how the interpreter validates that you passed the right number of arguments to a callable. For now, we’ll say you can’t pass any. When we get to user-defined constructors, we’ll revisit this. print bagel; // Prints "Bagel instance". It doesn’t do much, but it’s starting to do something. We have instances, so we should make them useful. We’re at a fork in the road. We could add behavior first—methods—or we could start with state—properties. We’re going to take the latter because, as we’ll see, the two get entangled in an interesting way and it will be easier to make sense of them if we get properties working first. Allowing code outside of the class to directly modify an object’s fields goes against the object-oriented credo that a class encapsulates state. Some languages take a more principled stance. In Smalltalk, fields are accessed using simple identifiers—essentially variables that are only in scope inside a class’s methods. Ruby uses @ followed by a name to access a field in an object. That syntax is only meaningful inside a method and always accesses state on the current object. Lox, for better or worse, isn’t quite so pious about its OOP faith. After a primary expression, we allow a series of any mixture of parenthesized calls and dotted property accesses. “Property access” is a mouthful, so from here on out, we’ll call these “get expressions”. You can literally see that property dispatch in Lox is dynamic since we don’t process it during the static resolution pass. First, we evaluate the expression whose property is being accessed. In Lox, only instances of classes have properties. If the object is some other type like a number, invoking a getter on it is a runtime error. Paradoxically, many of the optimizations invented to make dynamic languages fast rest on the observation that—even in those languages—most code is fairly static in terms of the types of objects it works with and their fields. So the first thing we do is see if the instance actually has a field with the given name. Only then does it return it. Otherwise, it raises an error. Note how I switched from talking about “properties” to “fields”. There is a subtle difference between the two. Fields are named bits of state stored directly in an instance. Properties are the named, uh, things, that a get expression may return. Every field is a property, but as we’ll see later, not every property is a field. In theory, we can now read properties on objects. But since there’s no way to actually stuff any state into an instance, there are no fields to access. Before we can test out reading, we must support writing. Note here that only the last part, the .meat is the setter. 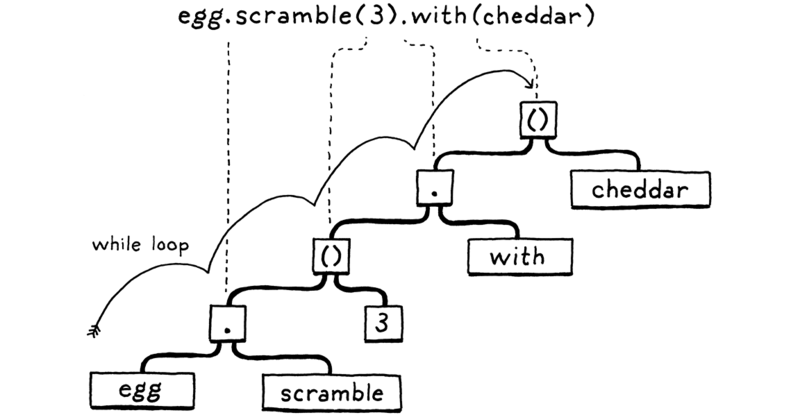 The .omelette and .filling parts are both get expressions. In case you don’t remember, the way we handle assignment in the parser is a little funny. We can’t easily tell that a series of tokens is the left-hand side of an assignment until we reach the =. Now that our assignment grammar rule has call on the left side, which can expand to arbitrarily large expressions, that final = may be many tokens away from the point where we need to know we’re parsing an assignment. Instead, the trick we do is to parse the left hand side as a normal expression. Then, when we stumble onto the equals sign after it, we take the expression we already parsed and transform it into the correct syntax tree node for the assignment. Again, like Expr.Get, the property itself is dynamically evaluated, so there’s nothing to resolve there. All we need to do is recurse into the two subexpressions of Expr.Set, the object whose property is being set, and the value it’s being set to. Raise a runtime error if it’s not an instance of a class. The order that those are performed could be user visible, which means we need to carefully specify it and ensure our implementations do these in the same order. No real magic here. We go straight to the Java map in the instance where fields are stored. Since we allow freely creating new fields on instances, there’s no need to see if the key is already present. You can create instances of classes and stuff data into them, but the class itself doesn’t really do anything. Instances are just maps and all instances are more or less the same. To make them feel like instances of classes, we need behavior—methods. This program “looks up” the method and stores the result—whatever that is—in a variable and then calls that object later. Is this allowed? Can you treat a method like it’s a function on the instance? This program creates an instance and then stores a function in a field on it. Then it calls that function using the same syntax as a method call. Does that work? Different languages have different answers to these questions. One could write a treatise on it. For Lox, we’ll say the answer to both of these is that, yes, it does work. We have a couple of reasons to justify that. For the second example—calling a function stored in a field—we want to support that because first class functions are useful and storing them in fields is a perfectly normal thing to do. If you grab a handle to a method on some instance and call it later, does it “remember” the instance it was pulled off from? Does this inside the method still refer to that original object? Does that last line print “Bill” because that’s the instance that we called the method through, or “Jane” because it’s the instance where we first grabbed the method? Lox, though, has real class syntax so we do know which callable things are methods and which are functions. Thus, like Python, C#, and others, we will have methods “bind” this to the original instance when the method is first grabbed. Python calls these “bound methods”. I know, imaginative name, right? In practice, that’s usually what you want. If you take a reference to a method on some object so you can use it as a callback later, you want to remember the instance it belonged to, even if that callback happens to be stored in a field on some other object. Storing the function type in a local variable is pointless right now, but we’ll expand this code before too long and it will make more sense. When we interpret a class declaration statement, we turn the syntactic representation of the class—its AST node—into its runtime representation. Now, we need to do that for the methods contained in the class as well. Each method declaration blossoms into a LoxFunction object. When looking up a property on an instance, if we don’t find a matching field, we look for a method with that name on the instance’s class. If found, we return that. This is where the distinction between “field” and “property” becomes meaningful. When accessing a property, you might get a field—a bit of state stored on the instance—or you could hit a method defined on the instance’s class. Looking for a field first implies that fields shadow methods, a subtle but important semantic point. Bacon().eat(); // Prints "Crunch crunch crunch!". Apologies if you prefer chewy bacon over crunchy. Feel free to adjust the script to your taste. We can define both behavior and state on objects, but they aren’t tied together yet. Inside a method, we have no way to access the fields of the “current” object—the instance that the method was called on—nor can we call other methods on that same object. To get at that instance, it needs a name. Smalltalk, Ruby, and Swift use “self”. Simula, C++, Java, and others use “this”. Python uses “self” by convention, but you can technically call it whatever you like. “I” would have been a great choice, but using “i” for loop variables predates OOP and goes all the way back to Fortran. We are victims of the incidental choices of our forebears. For Lox, since we generally hew to Java-ish style, we’ll go with “this”. Inside a method body, a this expression evaluates to the instance that the method was called on. Or, more specifically, since methods are accessed and then invoked as two steps, it will refer to the object that the method was accessed from. On the second-to-last line, we grab a reference to the speak() method off an instance of the class. That returns a function, and that function needs to remember the instance it was pulled off of so that later, on the last line, it can still find it when the function is called. We need to take this at the point that the method is accessed and attach it to the function somehow so that it stays around as long as we need it to. Hmm… a way to store some extra data that hangs around a function, eh? That sounds an awful lot like a closure, doesn’t it? If we defined this as a sort of hidden variable in an environment that surrounds the function returned when looking up a method, then uses of this in the body would be able to find it later. LoxFunction already has the ability to hold onto a surrounding environment, so we have the machinery we need. cake.taste(); // Prints "The German chocolate cake is delicious!". The parent of the body environment is the enviroment we created earlier to bind this to the current object. Thus any use of this inside the body successfully resolves to that instance. Now, whenever a this expression is encountered (at least inside a method) it will resolve to a “local variable” defined in an implicit scope just outside of the block for the method body. There isn’t much to it. We create a new environment nestled inside the method’s original closure. Sort of a closure-within-a-closure. When the method is called, that will become the parent of the method body’s environment. We declare “this” as a variable in that environment and bind it to the given instance, the instance that the method is being accessed from. Et voilà, the returned LoxFunction now carries around its own little persistent world where “this” is bound to the object. Go ahead and give it a try using that cake example from earlier. With less than twenty lines of code, our interpreter handles this inside methods even in all of the weird ways it can interact with nested classes, functions inside methods, handles to methods, etc. There is no instance for this to point to if you’re not in a method. We could give it some default value like nil or make it a runtime error, but the user has clearly made a mistake. The sooner they find and fix that mistake, the happier they’ll be. Yes, it could be a Boolean. When we get to inheritance, it will get a third value, hence the enum right now. We also add a corresponding field, currentClass. Its value tells us if we are currently inside a class while traversing the syntax tree. It starts out NONE which means we aren’t in one. As with currentFunction, we store the previous value of the field in a local variable. This lets us piggyback onto the JVM to keep a stack of currentClass values. That way we don’t lose track of the previous value if one class nests inside another. That should help users use this correctly and saves us from having to handle misuse at runtime in the interpreter. We can do almost everything with classes now, and as we near the end of the chapter we find ourselves strangely focused on a beginning. Methods and fields let us encapsulate state and behavior together so that an object always stays in a valid configuration. But how do we ensure a brand new object starts in a good state? For that, we need constructors. I find them one of the trickiest parts of a language to design and if you peer closely at most other languages, you’ll see cracks around object construction where the seams of the design don’t quite fit together perfectly. Maybe there’s something intrinsically messy about the moment of birth. A few examples: In Java, even though final fields must be initialized, it is still possible to read one before it has been. Exceptions—a huge, complex feature—were added to C++ mainly as a way to emit errors from constructors. The runtime allocates the memory required for a fresh instance. In most languages, this operation is at a fundamental level beneath what user code is able to access. C++’s “placement new” is a rare example where the bowels of allocation are laid bare for the programmer to prod. Then a user-provided chunk of code is called which initializes the unformed object. The latter is what we tend to think of when we hear “constructor”, but the language itself has usually done some groundwork for us first before we get to that point. In fact, our Lox interpreter already has that covered when it creates a new LoxInstance object. We’ll do the remaining part—user-defined initialization—now. Languages have a variety of notations for the chunk of code that sets up a new object for a class. C++, Java, and C# use a method whose name matches the class name. Ruby and Python call it init(). That’s nice and short, so we’ll do that. When a class is called, after the LoxInstance is created, we look for an “init” method. If we find one, we immediately bind and invoke it just like a normal method call. The argument list is forwarded along. If there is an initializer, that method’s arity determines how many arguments you must pass when you call the class itself. We don’t require a class to define an initializer, though, as a convenience. If you don’t have an initializer, the arity is still zero. That’s basically it. Since we bind the init() method before we call it, it has access to this inside its body. That, along with the arguments passed to the class, is all you need to be able to set up the new instance however you desire. Can you “re-initialize” an object by directly calling its init() method? If you do, what does it return? A reasonable answer would be nil since that’s what it appears the body returns. Maybe “dislike” is too strong a claim. It’s reasonable to have the constraints and resources of your implementation affect the design of the language. There are only so many hours in the day and if a cut corner here or there lets you get more features to users in less time, it may very well be a net win for their happiness and productivity. The trick is figuring out which corners to cut that won’t cause your users and future self to curse your short-sightedness. If we’re in an initializer and execute a return statement, instead of returning the value (which will always be nil), we again return this. Phew! That was a whole list of tasks but our reward is that our little interpreter has grown an entire programming paradigm. Classes, methods, fields, this, and constructors. Our baby language is looking awfully grown-up. print Math.square(3); // Prints "9". You can solve this however you like, but the “metaclasses” used by Smalltalk and Ruby are a particularly elegant approach. Hint: Make LoxClass extend LoxInstance and go from there. print circle.area; // Prints roughly "50.2655". What are the trade-offs between these approaches and why might a language prefer one or the other? In this chapter, we introduced two new runtime entities, LoxClass and LoxInstance. The former is where behavior for objects lives and the latter is for state. What if you could define methods right on a single object, inside LoxInstance? In that case, we wouldn’t need LoxClass at all. LoxInstance would be a complete package for defining the behavior and state of an object. We’d still want some way to reuse behavior across multiple instances. Since there are no classes, we’ll let a LoxInstance delegate directly to another LoxInstance to reuse its fields and methods, sort of like inheritance. The end result is a simpler runtime with only a single internal construct, LoxInstance. Users would model their program as a constellation of objects, some of which delegate to each other to reflect commonality. There are no longer classes. Instead, individual objects that are delegated to represent “canonical” or “prototypical” objects that others refine. That’s where the name “prototypes” comes from for this paradigm. It was invented by David Ungar and Randall Smith in a language called Self. They came up with it by starting with Smalltalk and following the above mental exercise to see how much they could pare it down. Including more than a handful by yours truly. I won’t get into whether or not I think prototypes are a good idea for a language. I’ve made languages that are prototypal and class-based, and my opinions of both are complex. What I want to discuss is the role of simplicity in a language. None of these are precise numeric measures. I’m using math as analogy here, not actual quantification. Breadth is the range of different things the language lets you express. C has a lot of breadth—it’s been used for everything from operating systems to user applications to games. Domain-specific languages like AppleScript and Matlab have less breadth. Ease is how little effort it takes to make the language do what you want. “Usability” might be another term, though it carries more baggage than I want to bring in. “Higher-level” languages tend to have more ease than lower-level ones. Most languages have a “grain” to them where some things feel easier to express than others. Complexity is how big the language is (and its runtime, core libraries, tools, ecosystem, etc.). People talk about how many pages are in a language’s spec, or how many keywords it has. It’s how much the user has to load into their wetware before they can be productive in the system. It is the antonym of simplicity. Reducing complexity does increase power. The smaller the denominator, the larger the resulting value, so our intuition that simplicity is good is valid. However, when reducing complexity, we must take care not to sacrifice breadth or ease in the process, or the total power may go down. Java would be a strictly simpler language if it removed strings, but it probably wouldn’t handle text manipulation tasks well, nor would it be as easy to get things done. The art, then is finding accidental complexity that can be omitted. Language features and interactions that don’t carry their weight by increasing the breadth or ease of using the language. 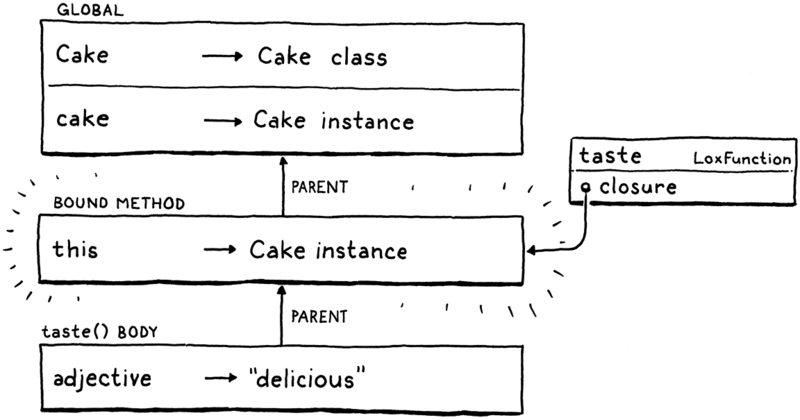 If users want to express their program in terms of categories of objects, then baking classes into the language increases the ease of doing that, hopefully by a large enough margin to pay for the added complexity. But if that isn’t how users are using your language, then by all means leave classes out.